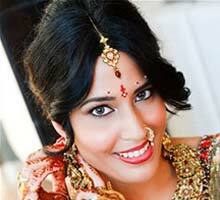 Like most South Asian brides, I wanted to have a different look for each event. For the Sangeet, which was our first event, I chose a vibrant, modern turquoise sari to set the tone for the rest of the events. For the mehndi, I wanted something casual and comfortable so I chose a green skirt with a sleeveless blouse. For the wedding ceremony I knew I wanted a pink sari and ended up with a beautiful rose-colored sari with a turquoise border- another splash of my color scheme. For the reception I wanted a lehenga but not a traditional red; but I ended up opting for a red lehenga because I really loved the antique gold work and design of a lehenga I saw in a South Delhi boutique. I did not want it to be too heavy so I could dance and I asked the designer to make the dupatta lighter and also got a very light red scarf so after the dancing began I could take the dupatta off and just use the scarf. Sabeena getting ready for reception. Me and my mother, along with Patrick and his mother went to Delhi. I love Ritu Kumar but did not find anything at her store that really caught my eye so I ended up finding most of my clothes in South Delhi boutiques. Suman Khosla did my hair and make-up for the wedding ceremony and for the reception. For the ceremony she did a more natural, daytime look that matched the rose-colored sari. For the reception I wanted a more fun look so she restyled my hair so I could wear it down and redid my make-up so that my eyes were smokier. It was fun to have such different looks on the same day! You should have open communication with your families about what is important to them and what is important to you so that everyone has fun that day. I also would recommend being organized during the planning process and using websites like WeddingSutra, the knot, etc to get ideas from other brides and recommendations on vendors. For the Wedding day I would advice you to just relax, you've already planned whatever you could so you need to enjoy the day itself! So forget about the small or big problems and just relax and have fun!